This year, the Czech Republic commemorates the fiftieth anniversary of the Soviet August occupation in 1968, and President Milos Zeman decided to “celebrate” him with great silence. It does not let the nation even the bonito. According to the castle spokesman, George Ovčac, Zeman has said everything to Soviet occupation in 1968, when he “courageously” disagreed with it. They soon left him out of the Communist Party. Really bold . Some people with occupation then disagreed so boldly that Soviet troops were killed on the spot. Zeman just expelled from the party, which in fact made the Communists themselves in the future improve the cadre profile . He did not have to talk to Letna in 1989 at least as a Communist against the Communists , it would be more of a brute. But true courage is measured a little differently. In addition, Zeman likes to teach, which, unfortunately, he has been doing more and more often at the wrong time at the wrong time. Not only because of his warm friendship with Russian President Vladimir Putin, we are rebuilding the Russian satellite in the world . The fiftieth anniversary of the Occupation would offer the president the right time and the right place for “courage”: the nation would give a few sentences on August 21 at the Prague Castle, a symbol of Czech statehood. Best without vodka. And especially if, according to a Median survey, more than a third of young people aged 18-34 do not even know that some occupation occurred in 1968. Jim Zeman could improve historical knowledge. And to remind others that even though Russia is once again as aggressive as the former Soviet Union, and occasionally someone resents peacefully or “free” from part of the territory, fortunately Czechia belongs elsewhere. In addition, the president could let go of his old age and revenge on the Russians for an insult to the whole of the Czech Republic in the fall of last year during Zeman’s visit to Moscow. At that time, the Russian Army Television web site, Zvezda, wrote that we should be grateful to Russia for occupational assistance. Yes, Zeman opposed it at that time, and it was too much for him. The fiftieth anniversary, however, gives an extraordinary symbolism, as other top politicians, including Prime Minister Andrei Babis, have understood. Most of them will therefore speak on August 21st. Indeed, Zeman speaks out in his final silence, and the silence of the Soviet invasion of twenty years worshiped the Communists. Let us hope at least that the president will not “celebrate” this day at the Russian Embassy. However, the presidential “August” bizarre does not end there . 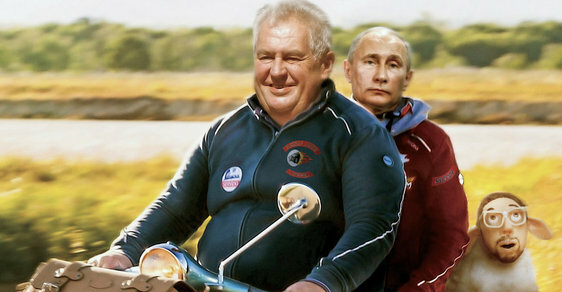 If Zeman is silent, maybe at least Czech President Andrej Kiska will speak on Czech TV. The Czech Republic will receive another “fraternal” help on this day. Kiska has fewer friends than Zeman in Russia and is preparing his own speech at home in Slovakia, where public media have therefore asked for extraordinary entry. Czech Television may want to broadcast it as part of its special broadcast. If that happens, it will be thanks to Zeman’s total desecration of the fiftieth anniversary of the Soviet invasion. The Czechs will be listening to a foreign president on this day because they are silent. But maybe it’s better.